Today ‘s recipe is a light and tasty strudel full of vegetables and nutrients! In a large frying pan heat olive oil and add all vegetables finely chopped. Let them become tender, pour ouzo and wait until liquids are absorbed. Stir and add cheese. Remove from heat and add a beaten egg, mix well. Place a baking sheet on a baking tray, place the sheet of puff pastry on it, spread the filling over the pastry, fold and roll. Glaze with a beaten egg and sprinkle sesame all over. Bake at 180 C˚ for 30-40 minutes (until golden brown). 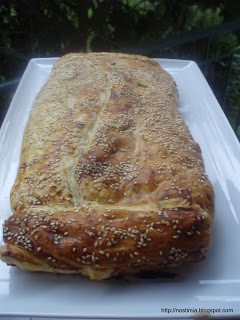 Next time I make this strudel I will make my own puff pastry and I will prefer a spicier cheese….. If you don’t use the whole filling, put it in the fridge. You can heat it the day after, add some milk and make a nice sauce for a pasta dish!That’s what we are going to eat today! Share the post "Strudel full of vegetables"